THE death occurred on Christmas morning of James Hunter Blair, extrovert laird of Blairquhan. But although renowned for his boisterous house parties, there was a serious side to the 78-year-old bachelor. And his flair for conservation, forestry and property management made him an able custodian of the family estate. 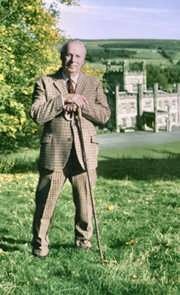 James Hunter Blair was born at Blairquhan on March 18, 1926, the youngest son of Sir James Hunter Blair, 7th baronet. Educated at Eton, he was commissioned in the Scots Guards, and after demob in 1948, went to Balliol College at Oxford. Jamie, as he was known to his friends, embarked on a career in merchant banking in London, but returned to Scotland after three years. He gained a knowledge of land management in a spell working on one of the Buccleuch estates, before going home to run Blairquhan for his father. Jamie first lived in the large estate house called Milton, before swapping homes with his widowed father, and moving into the mansion. He undertook a programme of restoration and improvement, both of the mansion and the estate, with the neglected walled garden a particular success. Jamie had a wide knowledge of architecture, furniture, Scottish painting, music, angling, trees and garden design. He was chairman in Scotland of the Historic Houses Association, president of the Royal Scottish Forestry Society, and chairman of the Ayrshire Rivers Trust. He served for 12 years on the Historic Buildings Council for Scotland, and was a trustee of the National Galleries of Scotland. Jamie was also a good friend to local groups such as Girvan Camera Club and Maybole Historical Society.